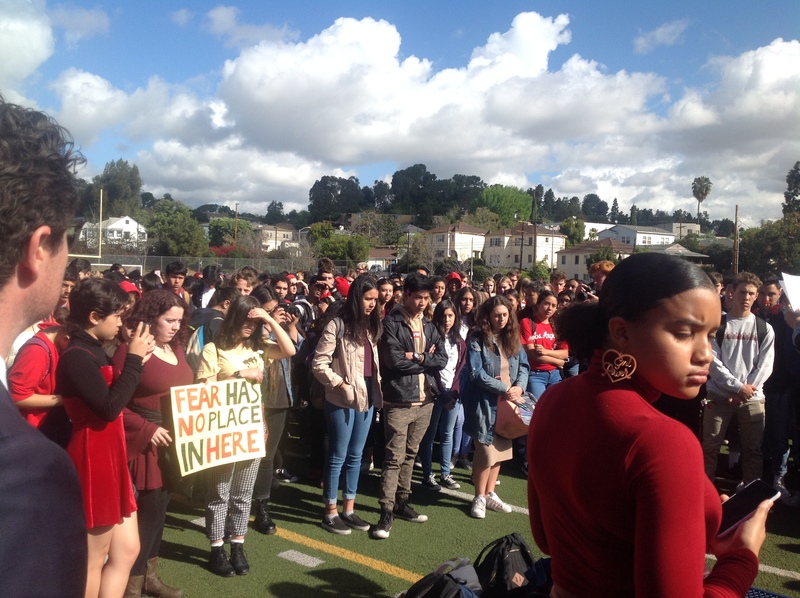 March 14, 2018 marked the day students across the United States walked out of their classes for 17 minutes to honor the 17 children shot dead in the Stoneman Douglas High School shooting, but mainly to protest gun violence by advocating for gun control. Because these students are increasingly gaining support from the media, Hollywood, teachers, etc., what they choose as “reasonable gun control” is going to result in significant approval. So I sought to question and challenge, the generally shared view on guns by the students to help find an answer on what is deemed as reasonable. By asking what they think and how the changes the nation thinks falls under people’s rights. Robert: I want to start off by asking where you lie, in a general sense, on the political spectrum, whether you are more liberal or conservative or a moderate, and what is your general stance on guns? Grace: I’m very liberal. I don’t believe guns should be accessible to civilians. The second amendment was created hundreds of years ago. Society has changed and we need to adapt to those changes. Having guns in homes and schools puts residents’ and students’ lives at risks. Robert: Some people would argue that’s not only a far left stance, but somewhat of a radical stance because of completely denouncing the second amendment. How do you respond to that? Grace: I believe the Constitution is a living document. When the second amendment was made, they felt it necessary to have state militias. Those militias aren’t needed anymore, yet people still feel they need to ‘protect’ themselves by owning guns. To me, this is illogical because bringing guns into homes makes them more dangerous. Guns in homes lead to gun-related injuries and deaths, both accidental and not. Those that own guns are also likely to have more than one. When a small percentage of the population owns half the guns in the country, it shows there is a problem. I think the idea of taking guns away is so radical because people treat them more as collectors items than weapons. They’re more focused on the fact that taking away their guns means taking away their property, instead of seeing it as the government making sure innocent people don’t die at the hands of them. Robert: What reasons made you attend the walk out today? Why were you there? Grace: I wanted to stand in solidarity with the students at Stoneman Douglas. I know how difficult it is as a student organizer not taken seriously by adults. They inspire me to be better and do better. My friends an I decided to organize this because we felt the lives lost needed to be addressed at our school. Robert: Do you agree to some extent that guns are an essential right? Or a human right? Grace: I don’t because thousands of innocent people have died at the hands of them. There are other ways to protect oneself that don’t involve assault rifles. Robert: Specifically, what is your definition of a well regulated militia? Since you’re against guns in general, consider your definition thinking about the fact that as of now Americans are entitled to own a variety of guns. Grace: I believe a “well-regulated militia” was what states in America’s early days had to protect themselves. Now that we are an established military power, the people don’t need to keep their guns on hand in case the British or French or something decide to invade. Robert: What about protection from our own government? A counter to your argument is to protect ourselves from our own government which is a big idea behind the second amendment. An example of that argument is “considering the significant number of police shootings against innocent people, mainly minorities, why wouldn’t those people want guns to protect themselves?” How do you respond to that? Grace: I don’t think people should own guns because they believe the government might become tyrannical. Keeping a dangerous weapon like a gun in a home because of some unwarranted fear risks the lives of those in the home. Since the birth of the second amendment, people have kept guns to protect themselves from a tyrannical government, but how often have they actually had to use it for that purpose? Never. This is greatly outweighed by the amount of gun-related deaths and injuries there have been since then. I believe there should be regulation in terms of the guns police officers have as well. They also need better training so that their first impulse isn’t to shoot. Robert: A counter to that would be guns never needed to be used to protect oneself from government because people had guns in the first place, so government could not attempt to turn tyrannical with an armed population. What’s your response to that argument? Grace: I understand that the intent was for protection from the government, however it is hundreds of years later. And while the armed population has been keeping their guns on standby in case they indeed do need to fight a tyrannical government, thousands of people have died as a result of their easy access to guns. None of the mass shootings would have occurred if the only weapon available to the shooter was a knife. At some point, the lives that have been lost and the lives that will be as a result of gun violence needs to outweigh gun owners’ fear of the government. Robert: What specific things are wrong with our gun laws? And what are the specific solutions to that? Since you’re against guns in general, would there be some middle ground solution you can propose? Grace: I believe military grade assault rifles, bump stocks, and high capacity magazines should be banned in every state. Right now, there are only 8 states that have banned assault weapons and high capacity magazines. Very few states prohibit bump stocks. All of these make it easy to kill many at one time and therefore make mass shootings easier to carry out. Robert: A lot of people are concerned with how the security guard at Parkland acted (refusing to go into the building where the shooter was to protect the kids) and with the FBI (where they dismissed many signals that could’ve pointed out Cruz would’ve done what he did). Considering this, do you trust big government to control the distribution of guns, for example with things like registering guns with the federal government? Grace: I believe it is the government’s obligation to control the distribution of guns. If and when they limit them, they show they show they aren’t being bought out by the NRA. This is when I will trust them. As of right now, I don’t trust many government officials (McCain, Burr, Rubio, etc.) because of the amount of money they have received from the NRA. To me, they will prove their trustworthiness once they take the measures to end gun violence. When the lives lost matter more than the money that have/will receive they will be trusted. Basically, when the government stops turning a blind eye to the thousands of gun-related deaths because they benefit monetarily from the limit of restrictions on owning guns, I will trust them. Grace: Making it more difficult to obtain guns will make it more difficult to commit mass murder. Studies have shown that other countries, like Australia, South Africa, and Austria, with stricter gun laws witnessed a large decrease in gun-related deaths. Robert: There’s an argument that says guns have been around forever but attempted mass shootings haven’t (virtually unheard of until Columbine) so some say mental health and culture is changing in a bad way, which is the issue. Is mental health or guns a bigger issue when it comes to mass shootings? As in which has the greater impact? And why? Grace: The fights to end gun violence and make mental health a priority are interconnected. Many people that have committed mass murder were mentally ill. I do believe more money needs to be invested into mental health resources, especially in schools. And mental health definitely plays a huge role in mass shootings, however without guns, people would not be able to kill as many people as they do. I think guns have the greater impact because of this. In theory, mental illness is the cause and mass shootings are the effect. Getting rid of the stigma around mental illness would get rid of the effect. This isn’t realistic because most people that are mentally ill don’t know it, or they do know it, but are in denial. Either way, they don’t receive the help they need and many peoples’ lives are cut short and their families left to grieve because of it. Robert: Is it worth restricting what the many people who obey the law can do when it comes to buying and owning guns, for the sake of only a few people not being able to do so correctly? Is the argument to target only those who can’t hold guns valid as opposed to making the majority of gun owners limited on their firearm accessibility? Grace: Yes, I do believe it is worth it. The few people that don’t handle them correctly have made a huge impact on our society. Columbine has changed America, especially the school systems, dramatically. And as to whether a person has a lot of guns or just one, accidents still happen. But an accident involving a gun is likely to cost someone their life. People’s livelihoods shouldn’t be jeopardized, so that people can keep their guns. Robert – “One child at the CNN town hall meeting told Dana Loesch (NRA spokeswoman who was chanted at with ‘shame on you’ when leaving the building) that the gun control advocates are taking care of her kids better than she is, while another asked Marco Rubio if he would never take another donation from the NRA (implying the NRA owns his decisions). Another asked if the blood of the dead Parkland students was worth the blood money of sme politicians. Another said the NRA has blood on its hands implying the Parkland massacre was their fault. Are these claims reasonable, legitimate, and acceptable? How do they affect the way both sides of the political spectrum have the conversation on guns to find a solution? Grace: I believe their claims were reasonable. None of the stated people have done anything to prevent gun violence from happening. I believe both sides of the spectrum need to own up to their mistakes in order to find a solution. The left needs to factor mental health into the equation and the right needs to realize that the society/country we live in now is much different from when the second amendment was born. Robert: How has your view on Trump changed, if it has, or what do you think of TRump, proposing a ban on bump stocks? Grace: My view on him hasn’t changed. I disagree with him on nearly everything. I think this is a step in the right direction, however since it’s not going through Congress I doubt it’ll come to pass. He also supports arming teachers, something I don’t agree with at all. I believe it’s both a step forward and a step back. Robert: Since liberalism is very focused around individual rights, which is also the basis for why there is a second amendment (individual rights), why would liberals not be supporting the Second Amendment? Grace: I believe that people have the right to live. Gun violence has stripped thousands of people of that. Robert: Do you think this national gun control movement puts the 2nd Amendment in jeopardy? Do you want that to be the case? If so, why? Grace: I do believe it puts it in jeopardy and I want it to be the case. As I stated earlier, we don’t live in the same country/society that we did when the second amendment was created. I don’t believe it benefits the country or its citizens any longer. Whether the majority of students who advocate for gun control want the second amendment repealed or not, it is worth mentioning there are many who do. There are also many other Americans who do, and they are well supported. The concept of protecting oneself using guns still applies in modern society, along with the concept of government failing to protect its citizens, as seen with local police and the FBI in Parkland not responding how they should have to what was going to be a mass shooting. Considering this, one should ask whether it is reasonable to limit the freedoms of gun owners and American citizens. What Grace did not answer: If no private person in her view has a right to self defense, that implies that their defense must be performed by the police, how did she feel when defenseless people were not protected by the police in the Stoneman Douglas shootings? After all, this was an exemplar of her policies at work — a group of people obeying the law by not bearing arms, and person who decided to ignore the law, and the police cowering in self-defense while the rampage went on. With guns present everywhere in the world — even in those places where they are supposedly outlawed — why shouldn’t people have a personal right of self defense using exactly the same tools the police use for their own personal defense (and, rarely than we would like, our defense) against criminals who afflict us all? A gun makes even the smallest woman fully the equal of one or more men who would take all that she has.